Comments on: "Barry Goldwater Quotes: American business has just forgotten the importance of selling." You don’t need to be ‘straight’ to fight and die for your country. You just need to shoot straight. He had probably been vaccinated with a phonograph needle. Goldwater was born in Phoenix, in what was then the Arizona Territory. 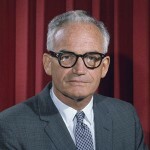 Goldwater graduated from Staunton Military Academy, an elite private school in Virginia, and attended the University of Arizona for one year, where he joined the Sigma Chi fraternity. With the American entry into World War II, Goldwater received a reserve commission in the United States Army Air Forces.